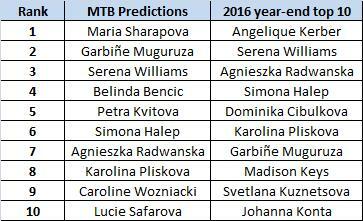 2016 WTA Predictions: How did Moo’s Tennis Blog do? Read on for a selection of quotes from my two 2016 prediction posts (top ten and best of the rest) to see how my judgements stacked up against reality. Oh Lucie… it was a tough year as illness derailed the first three months of the year. I feel like Lucie was just missing that big result to set her on her way. It never happened in 2016 but i’m hoping that with a proper off-season, she can prepare well for 2017. I’d fancy Karolina Pliskova to reach a couple of Slam quarter-finals and become a regulation top ten player. Not bad… Pliskova ended the year at number six, one place off her career high at the start of October. The Czech player finally broke through at a Slam by reaching the final of the US Open. Perhaps I was a bit negative about Radwanska but a semi-final showing at the Australian Open was the closest she came to that elusive Slam. After suffering her toughest loss of the year at Wimbledon in the third round to Jelena Jankovic, I believe that Petra Kvitova’s strength of character will shine through once again at SW19. Oops… this was a tad misguided as Petra Kvitova lost in the second round of Wimbledon to Ekaterina Makarova. A fully fit Petra in June will always be worthy of a mention for SW19 though. I think this will be Belinda Bencic’s big breakthrough year on tour. I’d fancy the 18-year-old to reach her first Grand Slam final and cement her place in the world’s top five. Not this time… Belinda had a rough year with injuries. While I think Serena will find her mojo again and win at least one Slam (i’m thinking the US Open), the reason I’ve gone for Serena at number three is that I question whether she will fully commit to the tour like she has done in the past couple of years. I’ll take that… I had Serena falling from world number one and winning one Slam (although I went for the wrong one!). I’m backing the Spaniard, Garbiñe Muguruza, to win her first Grand Slam title in 2016 at Roland Garros. Health will be a factor but with the allure of the Olympics and her desire and fighting spirit always shining bright, I think it will be a super year for Sharapova. Solid… Venus ended the year at number 17 and enjoyed her best result at a Slam since 2010 by reaching the semi-finals of Wimbledon.. While I expect Svitolina to continue to rise up the rankings and end the year in the world’s top 15, I think the next rise will be somewhat stunted unless she can be bolder and take more risks on court. Pretty happy with this! Svitolina ended the year at world number 14, matching her career best ranking with a rise of five places from this time last year. There were some positive signs from Svitolina towards the end of the year although splitting with long-term coach, Iain Hughes, was a surprise. I fancy Mladenovic to have a rewarding year in singles, cracking the top 20. Nope! I was high on Mladenovic last year and i’ll admit that I considered her in my top 10. The Frenchwoman fell 13 places compared to this time last year to number 42 in the rankings. I still believe that Mladenovic has one of the most complete games on tour but i’m not convinced she has the mentality right now to support it. Keys was actually the reverse in 2016 to above as she was consistently solid during the year and reached the second week of all four Slams, but didn’t have a stand-out result. While Dominika Cibulkova is likely to miss out on a seeding at the Australian Open, her battling qualities will no doubt earn her a seeding at the French Open as she continues her rise back up the rankings tree to where she belongs. I thought suggesting that Cibulkova would crack the top 20 was on the verge of being bold but she blew that thought out of the water with a stunning end to the year as she qualified for the WTA Finals in Singapore, won it, and cracked the world’s top five. December 13, 2016 in Off-Season, WTA. Not too bad in the circumstances James. You were unlucky with Sharapova, Belinda and Lucie as it was unexpected about what happened to them ( especially Maria ! ) but you got some other predictions correct. Going to be interesting to see how Maria gets on when she returns. Feel sure that she will get tons of media coverage and her matches should attract a lot of spectators…..to start with at least. I wouldn’t feel too bad about the predictions you got wrong James; women’s tennis must be one of the hardest sports (if not the hardest sport) to predict that there is. There are so many variables to take into consideration. Just one example; the torrential rain during the French Open meant that the wet, heavy conditions favoured stronger players like Sam Stosur, who reached the semi-finals even though she hadn’t distinguished herself in a major competition for some time. Kiki Bertens, another big, strong player, did well there too (and of course so did Garbine who won it – good prediction). You were right about Elina Svitolina and Karolina Pliskova doing well in 2016 too. Like you, I thought Belinda was going to do well again this year. I just hope she puts her disappointing season behind her and does better in 2017. BTW, I thought Madison Keys won a tournament and hence did have a standout result; was it Birmingham? Yes very true, Graham! I always enjoy looking back and seeing what I was thinking a year ago. Yes you are right that Madison won Birmingham. My comment was more focused on that she didn’t have a stand-out run at the Slam which I expected. Hi James – I’m back again 🙂 Had a stressful couple of weeks and just got through all your posts! I love that Angie is constantly featuring your best matches of the year! Yes predictions are predictions, just a bit of fun but I do enjoy looking back each year!